You loved our first article about the Retron3 and we know you’ve been waiting to hear more about it. Well! 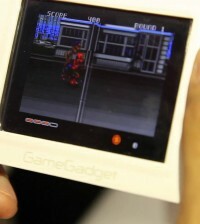 Das Reviews got an exclusive hands on with the brand new 3 in 1 retro gaming console at E3 2010! Want to know how well this plays Super Nintendo, Nintendo and Sega Genesis games? Watch the video and find out! Ready to get your retro gaming on? Head over to Das Cheap to get your Retron3 for the lowest price on the net!